Those who know me or have been following the (has-been-back-up-for-very-short-but-still) blog have come to figure out that I greatly enjoy train games. Now, I am not a fan of real-life trains, but as a theme or a game mechanic, I just find that trains and railways bring a lot to the table. You can do: stock market simulations; simple tech trees or advances; network building; goods delivery; simple or complex economic systems simulation. 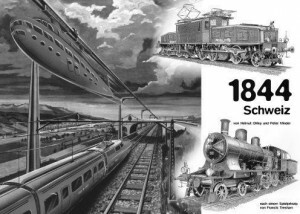 Of course, all train games are not equal and to me the apex of train games are a family of games known as 18XX, with 1829 and 1830 being the source of so much goodness. In this family you’ll find over 120(!) different games falling into that category. While they share a common framework, most of them bring tweaks or slight change to the basic system, sometimes to just the map, sometimes to the trains and tracks. Not all the variations are good, but those that are are fantastic. They are perhaps easier to teach/learn than most people think but they can be long, even with an experienced group. And taxing. And difficult to predict the first few times you play. And can lead to analysis paralysis for certain players. And a lot of fun with the right group. 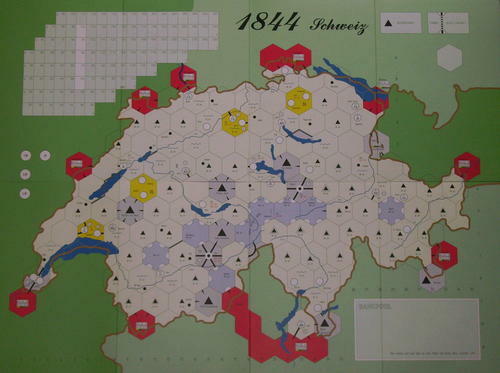 Which brings me to this week’s Session Report, as I’ve had the chance to play 1844 (Double-O games) by Peter Minder and Helmut Ohley this weekend for the first time. This particular title takes place in Switzerland, amid all the mountains and valleys. The copy of the game we played with was a first edition of the game and it showed. I’m used to Deep Thought Game quality which are, if not professionally printed and produced, still very well done. The quality of the components here was not very good. Jason had taken the time to laminate the board and certificates beforehand since he was afraid that they would get damaged as they were printed on very light card stock. Unfortunately, he did not laminate his turn order cards and he should have, seeing as they were on equally cheap card stock and they continuously changed hands during the game. The station markers were small plastic disks that were hard to pick up once put down. All of these are minor quibbles, as the game is still highly playable, but it’s just a step down from the quality we’re used to. But! And this is a big one, this was the first edition of the game, which is incredibly rare and hard to find. Fortunately, Mayfair has recently announced that they would be reprinting this game along with 1854 as a double-pack. This is great news despite some of the misgivings regarding their reprint of 1830, mostly having to do with how they packaged it and the “ugly” track art. At least the game is coming back in print and it will be in a much nicer edition. Like any games about business, the main goal of 1844 (or any 18XX) is to be the player who has the most money at the end of the game. Your money will come from two sources: cash in hand and the value of the various shares you have in the public rail companies. As the game progresses, players will be able to buy and sell these shares and as the various railways operate, the value of these shares will fluctuate. Buy the right ones, get rid of those whose value will fall at the right time is at the heart of the game, which makes 18XX games stock market games, but one where luck plays no part and where the players’ action dictate the vagaries of the market. One of the central component of 1844 is the stock market, a two dimensional grid where the current price of any of the publicly traded company is recorded using tokens. The values increase from bottom to top and from left to right. 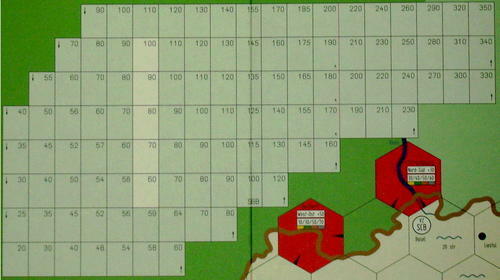 The position of the tokens also indicate the order in which the companies will operate during the Operating Round (OR). The game is broken down in a series of two types of rounds: the Stock Round (SR) and the Operating Round (OR). During his turn during the Stock Round, a player will be able to acquire a single share in the various railways, sell any amount of shares from a single company back to the Bank Pool or start a new company. To buy a share, the player simply pays the bank the current value of said share, takes it and checks to see if he has more shares than any single player. If he does, he then becomes the new director and takes the charter of the company along with station tokens, treasury and trains that the company may own. If he sells shares, he takes from the bank the current value of each share and then drops the price of the company by one row. So in a very simple way, we can see that companies lose value when stock holders sell their shares. To start a new company, a player simply announces his intention, takes the charter of a company that hasn’t been started yet, declare a par value (anywhere from 60 to 100), pays the bank twice that amount and takes the president’s share (this share is worth 2 shares). However, this doesn’t mean that the company can operate in the OR, simply that it exists. In order to be able to operate, it will need to have at least 50% of its shares in players’ hands, at which point the company will get 50% of its value (10 times the initial value). Once all players have passed, the SR is over and the value of the various railways are re-evaluated: should all shares of a specific railway be in players’ hand, then its value goes up one row. Again, this mimics the fact that a company which the stockholders strongly believe in tends to go up in value. Should the bank pool hold any companies’ shares, its value goes down one row. Also, note that a company’s actions are taken by its president (the player with the most shares) and, apart from cajoling or threatening, the other investors have no say. During the OR, the different railroads operate in order (highest to lowest value), doing the following actions in order: place new tracks, pay and place a station token, run train(s), pay or withhold dividends, buy train(s).You’ll notice that the last action is buying a train, which means the very first OR that a company is able to operate in, it will not have a train. Track placement is very simple: the player can extend any tracks that a train from any of the current company’s stations as long as it is not blocked and the company can afford the cost, if there is one. Tracks come in three flavors: simply tracks, tracks with a small town and tracks with large city. Large city is where you’ll find the biggest payouts, with values changing depending on the color of the track (more on this later). City track also have a number of large blank circles (from 1 to 4, depending on the color) where the companies will put down their station tokens. Tokens are important because when a company runs a train, it needs to have a station somewhere on the run and since you cannot use the same tracks for more than one train, you want more stations on the map. Should all the circles in a city be taken by stations of other companies, you will have to stop at that city and will not be able to go through it. It is then possible to bottle up a railway, keeping it in a very small run. Placing a station is similar to placing new tracks: you have to be able to reach it from your current station. Each additional station after the first has a cost associated with it which must be paid from the company’s treasury. Running trains is simple: using each train that the company owns, you decide what cities, town, off-map and mountains location you’ll run as long as they are all on the same track system, are within the limits of the train (more on that later) and include at least one of the companies station somewhere on the run. Hit two off-map locations that indicate either an East-West or North-South bonus and add that to the run. Total up the printed values for each of these stops, add the value of all the runs together and then you decide what the company will do with the cash: pay it out to the stockholder or withhold it. If the company decides to pay out, each stock holder states what percentage of the shares they hold and they get that percentage of the train run and then the president of the company moves the stock token by one column to the right (stock pays? values goes up!). Should the company withhold the cash, it keeps it in the treasury and the stock value goes down one column to the left. As its last action, the company can elect to buy a train if: a) it can hold another train – the amount of trains a company can hold is limited and changes during the game; b) it can afford it. If the company has no train, it must purchase one. If it can’t afford it, the president must buy it out of pocket. It can either buy the lowest level train from the bank or from another company that it owns. The mechanic that drives the game forward is that of the Phases. Simply put, the Phases dictate the changes in the game and force the player to adapt. A change in phase will state: how many OR will take place between each sets of SR; which trains can now be purchased; which trains are now depreciated or rusted (removed from the game); how many trains each company can own; what companies can operate; what the value of off-maps connection are used and finally what color of track tiles can be laid. The best part? A phase change is triggered by the purchase of the last train of a type. Thus, with a very simple mechanic, the change in Phases is driven by the players’ action and since the change in Phase can also rust some trains, it is a neat mechanic that can be used to put pressure on your competitors or used to get rid of trains in order to purchase better ones since you cannot simply drop a train. And since it also drives the color of tracks laid and the value of off-map location along with the introduction of trains that can hit more locations, the phase changes increase the amount of money flowing in the game, thus simulating in a simple manner the booming of the economy. There are 6 levels of trains, and each has two different types. The 6 levels are simply a number (2, 3, 4, 5, 6 and 8), which indicates the amount of locations (town, city, off-map location or mountain) that the train can visit. The basic, and more expensive, type is simply that. There is another type however which is cheaper: the H trains, which instead of being the amount of locations that a train can hit, is the amount of tracks the train can hit. It carries the additional restriction of not being able to reach off-map locations. Note that when trains depreciate, they will always switch to this side (from 2 to 2H, for example), being less useful (but at least you still have a train). The only exception to this is the all-powerful 8 train, which comes in the 8 type but also the 8E type. This type of train is able to pick and choose the location it hits, ignoring the cheaper ones along its route. Needless to say, this train usually scores the highest runs. Trains get more expensive as the level goes up. 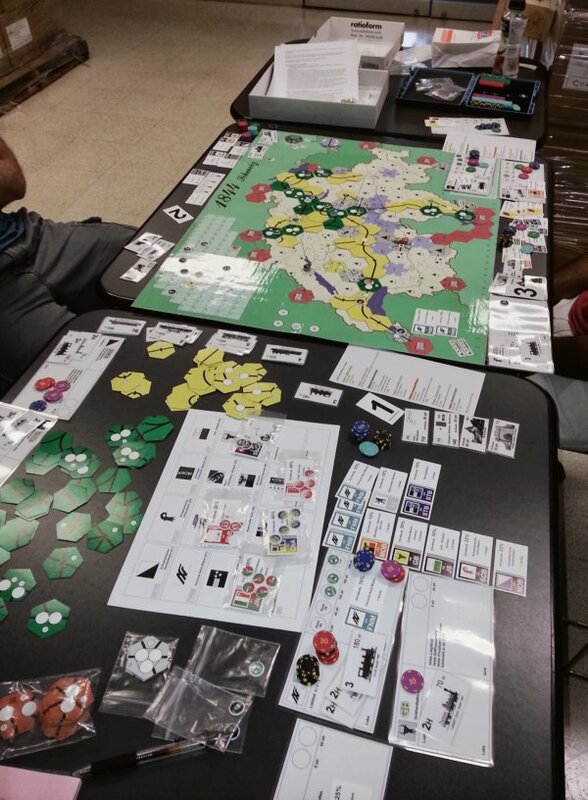 Most 18XX games have to large categories of companies: private companies, that have a single investor; and public companies that can have multiple investors. Private companies are small companies that are auctioned off at the start of the game. They usually do two things; give the player some money at the start of each OR and give you some special power that you can use once during the game. In 1844, there are companies that will: grant you a 5H train and then close; allow you to lay down trains over a mountain range and then pay you 80; give you a share of a company; give you the president’s share of a company and let you set the par price; etc. Knowing how much to bid and which private to get is crucial, since it will set up your game opening. While you can always recover later on, you’re off to a weak start. The main difference between 1844 and other 18XX is the 5 types of private companies: the Historical; Regional; pre-SBB; Tunnel; and Mountain. Historical companies are exactly that, companies that existed historically. They are “typical” 18XX companies as they are 10 shares companies and have no restriction as to the type of train, they are allowed to have the most trains or where they can operate. The amount of Station tokens that they receive is based on their initial par price: the higher the par, the more stations they can have. They also have a target city: once they have a legal route to this city, they receive the other 50% of their financing. Regional companies are small, 5 shares companies. They only receive 5X their par value and can only have 2 trains of type H. The pre-SBB (or pre national railway) companies are 4 shares companies that will eventually merge together and form the SBB. They also have a 2 train limit, but they are not limited to H trains and they also have a target city to reach to gain extra funds. When the SBB forms, all shares of these companies will be traded for shares in it on a 1 to 1 basis (note that since the SBB has 20 shares, shares will go from 10% to 5%). It is always an interesting decision whether to invest/start a V company. Timing plays a large role in this. There are also Tunnel companies, which are very different from private or public companies in that you don’t really run them. What they are in fact is more akin to a permit, which will allow you to place down a tunnel on one of several hexes (the tile is actually see-thru, which is very cool). You need to pay for this “permit” and the railroad who lays it down (it has to be one of the public companies of which you are the president) will also pay, as if it was laying a tile on a mountain or across a river. Once placed, any railroad that goes through the tunnel gains 10 per stop it makes during its run, in addition to “activating” it and flipping the certificate. This has two additional effect: a) it now acts like a private in that it will give you 10 at the start of every OR; b) it is now worth 50 at the end of the game. Should it not be activated by the end of the game, it would be worthless. Mountain companies are similar to Tunnel companies except that: a) they are more expensive; b) they give the player 40 at the start of every OR; c) they are worth 150 at the end of the game if it operated at least once; c) they are an end point and are similar to off map location. Unlike off-map location, the exact values of a Mountain company is set by the player who will pick one of 6 different sets of value and place it on the Mountain hex. Like Tunnel companies, there are less Mountain companies than Mountain locations on the map. The game ends when the bank goes bust (ie, where there is no more money in the bank). The game goes through 3 more OR where players can simply write down how much money was paid to them and then all players count up cash in hand, add the value of their shares and the value of Mountain and Tunnel companies that have operated at least once. The player with the most total cash wins. Even though it was a little hard to fully grasp the rules when reading them, once we got playing the game flowed nicely. 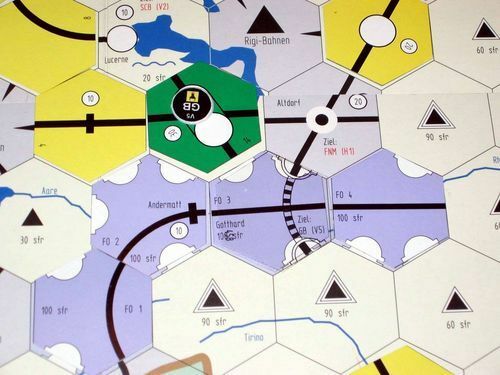 The basic flow is similar to a lot of other 18XX games, which is the advantage of playing many games in the series. The biggest hurdles is figuring out how the 3 different types of public companies play off each other and what to bid on the privates in the opening rounds. The Tunnel and Mountain companies are relatively easy to figure out and there wasn’t that much competition for them in our game. 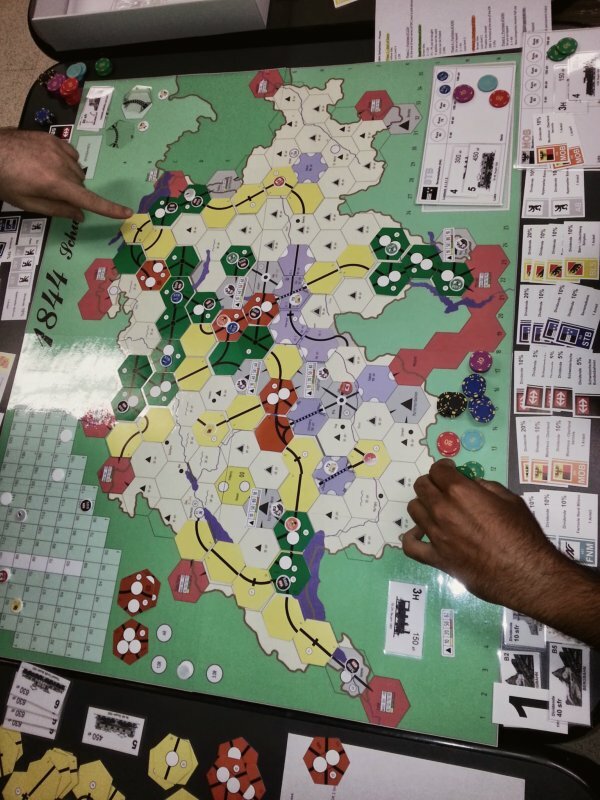 While not one of the most complex 18XX game (that honor might go to 1841, in my opinion), it does require a deft touch to figure out when to invest, in which type of company and how to handle the train transition. And the train transition is strange, with the trains not rusting right away but rather downgrading to their H counterpart. Depending where your public companies are situated, H trains can still run for good money. On the other hand, since they don’t leave right away, you can’t get a better train right away, instead having to shuffle trains around instead. The merger of the pre-SBB companies into the SBB is also tricky, but not as much as 1856 since there are enough shares to go around and no one will get screwed out of a share. Also, the fixed value of SBB shares mean that potentially extra cash will be pushed into the players’ hands, which is more money to make sure that you’re at your share limit. 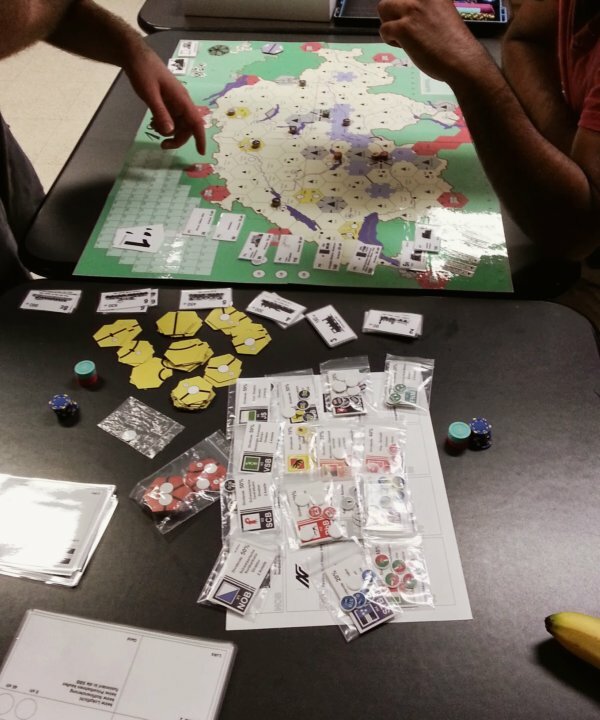 This is not a “learning” 18XX game however. While the rules are simple enough, understanding how they affect each other is hard for a newcomer. While you may think that you’re a fast learner, starting with this game instead of 1889 or one of the smaller regional games (18VA or 18Neb come to mind) or even Poseidon would be a mistake. I’m looking forward to playing again, even though I made my typical mistake late in the game of not paying attention to the coffers of companies I had multiple shares of. Needless to say, when Vic was left with a company that would be bottled in and had no train nor cash, he dumped it on me at the first occasion, leaving me on the hook for the new train. I tried to turn it around by dumping a company on him as well, but its setup was too good and he was able to buy a train out of pocket and get it to run for a North-South bonus which gave him and Jason lots of cash late in the game. This entry was posted in Session Report and tagged 1844 on September 6, 2013 by TopDog.